12 Apr 2019 --- Global food and drink packaging manufacturer Huhtamaki has launched blueloop, a new range of recyclable, flexible packaging made of mono-material PP, PE and paper. The new range builds on the standard materials that are widely recycled and will have an economically viable use after collection. Packaging design has a major impact on recyclability, leading manufacturers to increasingly design their packaging with recyclability as a clear driver. 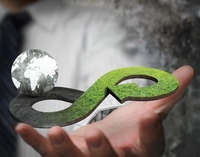 “We are convinced that future packaging needs to fit in a circular economy. There is also growing consumer interest which was even already there before the proposed legislation came in. Also, our customers are increasingly asking for recyclable solutions,” Michael Hahl, Sustainability and Strategic Innovation Director at Huhtamaki, tells PackagingInsights. Packaging is changing from a linear one-time use model to a circular model where materials are collected, recycled and reused. This movement is driven by consumer demand for more sustainable solutions, changes in legislation and companies working to create more sustainable ways to manufacture and package goods, the company notes. The blueloop solutions involve innovative polyolefin structures to pack coffee, snacks, dry food, personal care as well as other fast-moving consumer products. The range also includes paper-based solutions to replace plastic packaging. Hahl notes that the company is pursuing R&D in packaging for different liquid products, but hopefully, a launch will come in this domain in the future. “Collaboration is key. We engage with the full supply chain from resin providers to our customers and recyclers. Our closest focus is on product design and manufacturing. However, collecting, sorting and reusing the recycled material is all part of the blueloop perspective,” says Hahl. Huhtamaki also encourages food packers and brand owners to make recycling and pack material information much more visible on the pack. It will not only help consumers to recycle the packaging, but it can also build brand image. By 2025, EU regulations state that 55 percent of all packaging must be recycled. Also, although it will differ by member state, as a rule of thumb, plastic products must contain 25 percent recycled content by 2025 and 30 percent by 2030. Mono-material solutions increase ease of recycling and can also often tolerate recycled content. 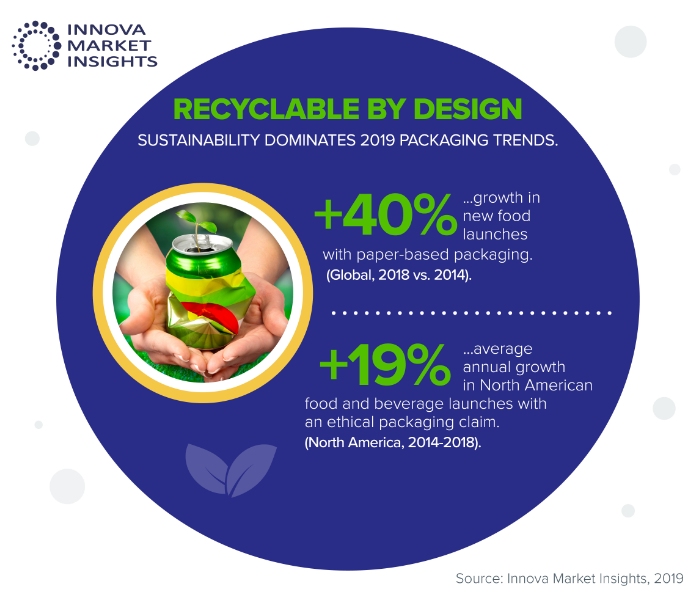 In line with this, Innova Market Insights has pegged “Recyclable by Design” as its number one packaging trend for 2019. Click to EnlargeBy 2025, EU regulations state that 55 percent of all packaging must be recycled. 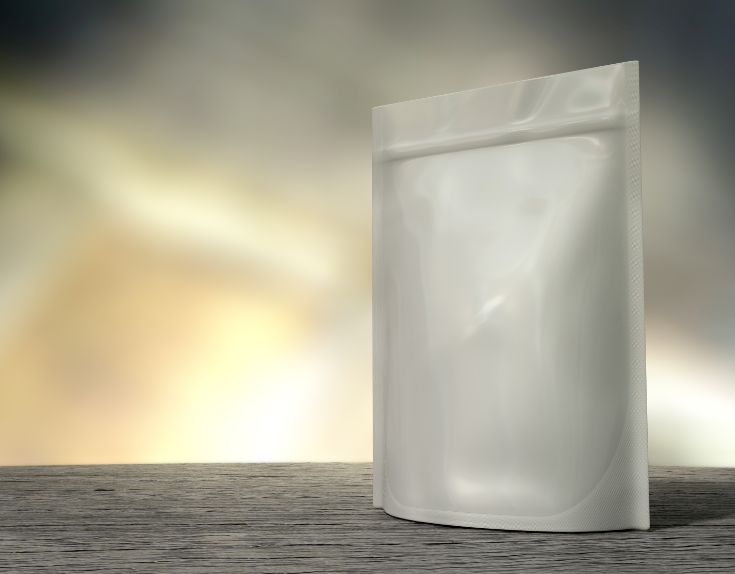 Flexible packaging such as pouches can be tough to produce as mono-material. Further building on its flexible packaging capabiltiies, Huhtamaki inaugurated a new flexible packaging unit in the greater Cairo area that will serve customers in Egypt as well as exports into other African countries and Europe. The manufacturing unit is built on a land area of almost 37,000 square meters, with ample space for future expansion. At the recent Empack trade show in the Netherlands, the rise of mono-material solutions was clear. Touted as a “game changer in film packaging,” British RPC bpi protec’s new X-EnviroPouch grabbed the attention. The pouch touts a 100 percent recyclable PE barrier film that delivers both an oxygen and water vapor barrier. However, creating circular packaging can be a major challenge for producers particularly because the industry lacks a clear standard. In a bid to simplify the process and increase recycling rates, SUEZ, who offer innovative and sustainable solutions for waste, has released a new set of guidelines – SUEZ.circpack – that hope to assist brand-owners in designing for recyclability. Wherever we are, we adapt and deliver packaging that meets local demands. We work efficiently and with respect for the world around us, demonstrating our values every day – always providing quality products with reliable service. Helping great products reach more people, more easily.